2018 – The Goldies Charity now reaches out to brighten the lives of 100's of older isolated people across England and Wales. In the past ten years, we have come a long way and now run our popular singing and activity sessions across England and Wales. Those attending are older people who are socially isolated as well as people with learning difficulties and dementia. For many “Goldies” is their lifeline and we hear this at every session from the people who attend. We started in 2008 with just four singing sessions in Bath & North East Somerset in sheltered housing community rooms all taken by our founder Grenville Jones. Now we have over 70 monthly sessions in England and many more planned this year. In Wales under the Goldies CYMRU banner we now have 45 sessions with plans to extend this further during 2018. Our schools community projects also continue to bring together the young with the young at heart and in 2016 we opened our first GOLDIES CHARITY SHOP in Keynsham High Street. Monthly sessions in the West take place across Bristol, South Gloucestershire, North Somerset, Wiltshire with new sessions added last year in Wiltshire, Gloucestershire, Somerset, Gloucester City and Andover. We also started new sessions in Essex, The Midlands and Bradford, Yorkshire. There are now over 60 brilliant freelance session leaders – and we always want to hear from new people who would like to be Session Leaders. We have built on our vision to include sessions for more diverse communities with sessions that engage with Afro Caribbean Elders. Sessions continue in Swindon where we are delighted to recognise the support of Swindon Borough Council, the only local authority that has consistently funded Goldies for the past five years. Here are some pictures taken at the launch of our 100th session in 2015. By the close of 2017 we hope to be running over 170 sessions across England and Wales. Why start a Charity called Golden-Oldies? The Channel Four programme Young@Heart and the BBC2 Television programme The Zimmers in 2007 highlighted social issues and loneliness facing older people. More importantly, these two programmes showed how singing “popular“ music can take people back to happy times and bring joy and friendship to their lives. Those progammes were the inspiration to Goldies founder and choir leader Grenville Jones who lives in the West Country City of Bath. In the UK there are millions of people who are living in isolation and missing out on regular contact with their family and friends. Getting together, making friends and having fun are the basis of this Charity and its simple ethos - to give people events they can look forward to. The Golden-Oldies Charity is based on the well documented fact that singing is good for you, it encourages good breathing and brightens up your day and gives you a chance to meet other people. It puts a SMILE on your face! We were delighted the announce in March 2011 that Sir Cliff Richard had agreed to be our Patron. 'The ethos of this Charity is very simple - it is to give people something to look forward to, a REASON to get out of their homes and be with others. This can be the monthly singing session in a sheltered housing community room or in a local church or community hall . It could be a trip to the local school as part of the Time after Time project, a concert or a visit to meet and sing with another Goldies session. 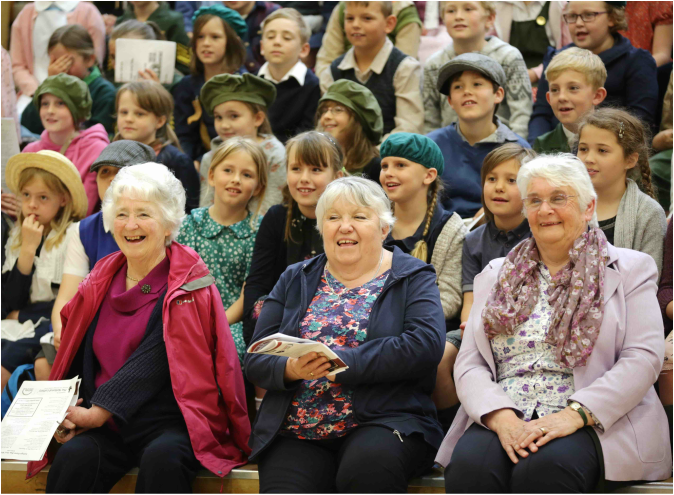 Our picture at the bottom of this page shows part of the audience of Goldies who attended one of our BIG SING's at Writhlington School near Bath in 2012. "Singing should be on prescription," says our founder Grenville Jones. The songs are carefully chosen and based on the well known sing-along his of the 50s 60s & 70s. They encourage people to clap in rhythm to the music, tap their feet, smile and more often that not ... get up and dance! Bring me Sunshine – Summer Holiday – Magic Moments – Downtown - Hi Ho Silver Lining and many more. If you are reading this from elsewhere in the UK and are wondering how Golden-Oldies can be introduced in your area then we would like to hear from you. Please email Emma and we will get back to you as soon as we can. We are only a small team but we are growing thanks to the support from many Trusts and commercial sponsors.